I’ve had a difficult pregnancy. I felt horrible, had almost every side-effect that I could possibly have, and suffered from a morning all-day sickness up until the day my daughter was born. My baby had a difficult start in life and we spent more than 7 weeks in various hospitals but once she got home, everything changed. The life that I was dreading, sleepless nights, exhaustion, countless diaper changes, didn’t actually bother me at all. I felt energized and oddly relaxed. I did not experience the lack of sleep. I took a nap for the first time only six or seven months after we came home not because I didn’t have time but because I didn’t need one. We had challenges, of course. There were witching hours and problems with feeding but it was nothing that bothered me. I cooked and blogged when she was sleeping. And I watched tv and read books when she was up and I was feeding her. Once she became more aware and curious, she sat in her bouncy chair next to me in the kitchen and watched me with her big curious eyes. We played games, sang songs, and went for long walks. As my maternity leave grew closer to the end, I made a difficult decision to stay home with her. Sending my preemie to a daycare in the middle of a flu season did not seem like a good idea, so I chose to stay home with her. And then, just as the winter was finishing up and I was looking forward to all the warm weather, my baby, my sweet and calm and mellow daughter switched to one nap a day. And then she turned into a monster. A very cute, mind you, but still a monster! 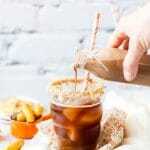 So, what does that story have to do with this Peanut Butter Iced Coffee? Well, my toddler made me so unbelievably miserable that I couldn’t tolerate that and sent her to a part-time daycare. Suddenly, she got a lot happier and I got a lot happier! A couple of weeks ago, after dropping off my little monster at her daycare for the morning, I found myself enjoying a coffee and munching on some totally delicious (and totally bad for you) peanut butter puffs. And this is how this recipe came to be! The moral of the story: part-time daycare for baby means a lot of delicious and refreshing and sinfully good peanut butter iced coffee for mommy! 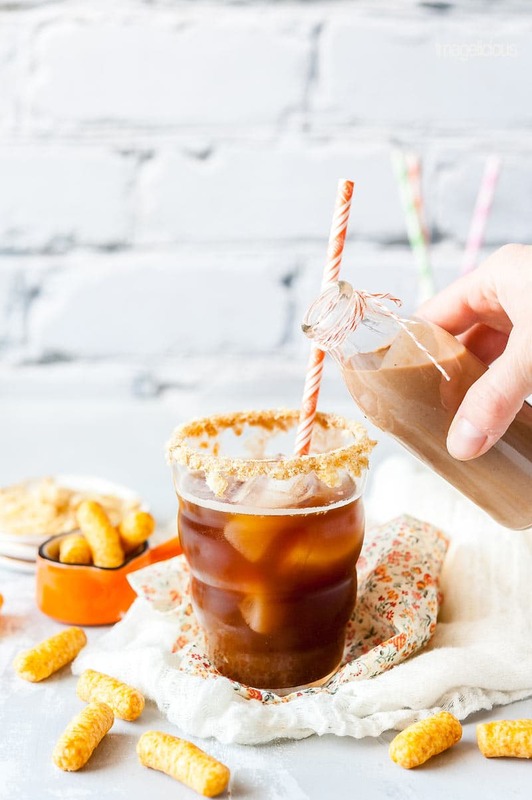 This Peanut Butter Iced Coffee made with Homemade Peanut Butter Creamer is perfect to sip in the afternoon when it’s hot outside. It’s also absolutely amazing in the morning but even when it’s hot outside I prefer my morning coffee to not be iced. How to make Peanut Butter Creamer? It’s super easy. In a small pot (or a small sauce-pan) combine peanut butter with Nutella (for a slight sweetness) and half-and-half cream. Whisk until all melted and smooth, then add a bit more cream. Cool in the fridge. Enjoy in your coffee. 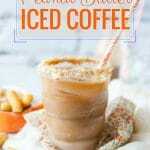 This Peanut Butter Iced Coffee Recipe is so easy to make! It only takes 5 minutes (and in reality it will be less than 5), so it’s a total mom-recipe! How can you use Peanut Butter Creamer? Depending on the size of your Iced Coffee, this amount of Peanut Butter Creamer could be enough for two coffees. The same amount of Peanut Butter Creamer is usually good for one hot coffee. This one is utterly sinful: just drink it hot straight up without any coffee! It’s totally delicious and totally indulgent!! I personally don’t add any sugar to my coffee. On occasion, I may order some fancy latte at a coffee shop and those are usually sweetened but I don’t particularly like sweet coffee. Nutella: I use it to very lightly sweeten my Peanut Butter Iced Coffee. It adds a bit of sweetness and creaminess and a fun chocolate taste to the creamer. Condensed Milk: It’s a very common addition to a Vietnamese Iced Coffee, so you can make your own peanut variation of that treat. Feel free to add more sweetener of your choice if you’d like. With all my love for unsweetened coffee, I would still keep my one tablespoon of Nutella as you need just a bit of sugar to mellow out the peanut butter taste. I’ve tried this creamer with Natural Peanut Butter and with Regular Peanut Butter. I know, I know, regular peanut butter is so bad for you, has a paragraph of ingredients, added sugar, salt, fat. But it just tastes so delicious! In this particular Peanut Butter Creamer Recipe I found that regular smooth peanut butter worked better than the natural (one ingredient) peanut butter. The regular stuff just blended in very smooth and made a very creamy creamer. The creamer made with natural peanut butter was just as delicious but not as smooth. I am very simple in terms of my iced coffee. I just make regular coffee and then stick it in the fridge to cool for a few hours. I use either my Nespresso and make a long Americano, which usually means I can stretch it to two Peanut Butter Iced Coffees or use a small French Press which means I also get two generous iced coffees from that press. 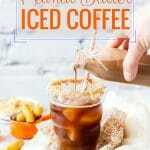 However, if you want to be a bit fancy, then you can try making Cold Brew Coffee with the technique from The Flavor Bender. She uses a really beautiful KitchenAid Cold Brew Coffee Maker. For a less sinful Peanut Butter Creamer, try using whole milk. It won’t be as creamy but will be just as delicious. Alternatively, for an utterly indulgent treat, you can try using 18% cream or 35% cream. 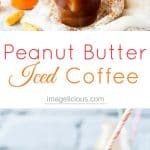 While developing and testing this Peanut Butter Iced Coffee Recipe, I used my whisk to make the Peanut Butter Creamer all blended and smooth. There were a couple of occasional lumps but they were deliciously full of peanut butter and Nutella. Mostly the creamer was, well, creamy. However, when I was making a video for this recipe, I used a spatula instead of a whisk as I didn’t have a whisk cute enough to be in the video (yes, those are the things I think about… cute whisks). Using a spatula meant that the Peanut Butter Creamer wasn’t as smooth as I would have liked. So, I used a blender to make a silky smooth homemade creamer. It is up to you if you want to use a blender or not. I usually don’t like to wash extra appliances so I don’t use the blender often but if it doesn’t bother you then blending the creamer will make the most delicious, smooth, silky, velvety creamer! 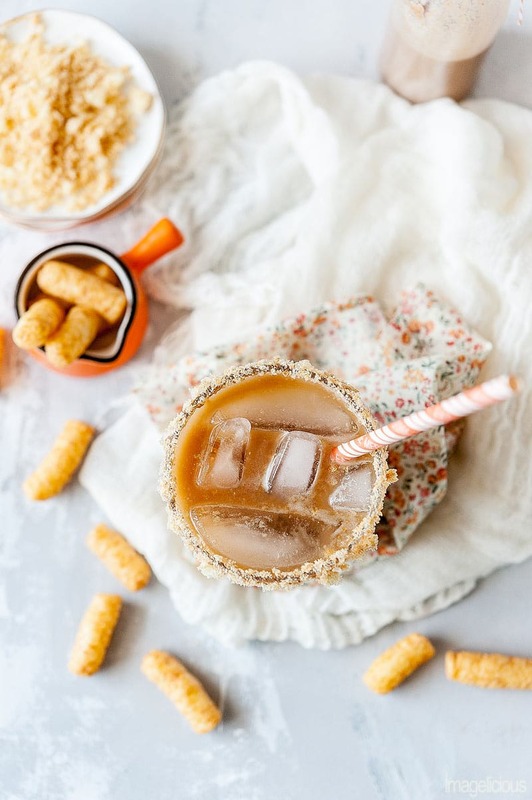 Can you make Vegan Peanut Butter Iced Coffee? Sure, you can! If you are following my recipe exactly then you need to find a vegan Nutella alternative and use some coconut cream (make sure to shake the can and use the liquid part) or your preferred vegan cream alternative. What are those weird things scattered around the glass? Well, those are the Peanut Butter Puffs that inspired this recipe!! Corn puffs like that were very popular in Soviet Union when I was growing up. They weren’t peanut butter flavoured. Just lightly sweetened and really addicting. If you go to a Russian grocery store, there will be at least half a dozen different brands of corn puffs. Peanut Butter Puffs are usually sold around here in Jewish supermarkets or sections of the stores. I assume that this delicious snack is very popular in Israel. 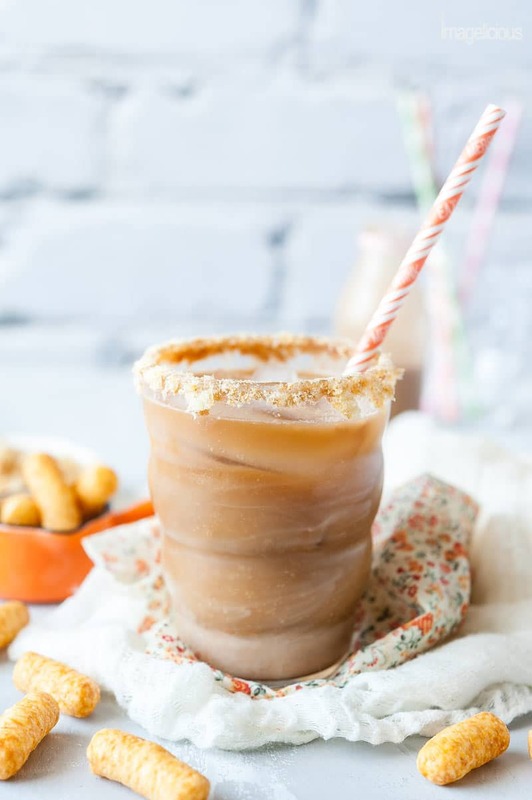 For this Peanut Butter Iced Coffee Recipe, I brushed a bit of the Peanut Butter Creamer over the edge of the glass and then dipped it into the crushed peanut butter puffs, just to add some crunchy contrast to the smooth and creamy iced coffee. 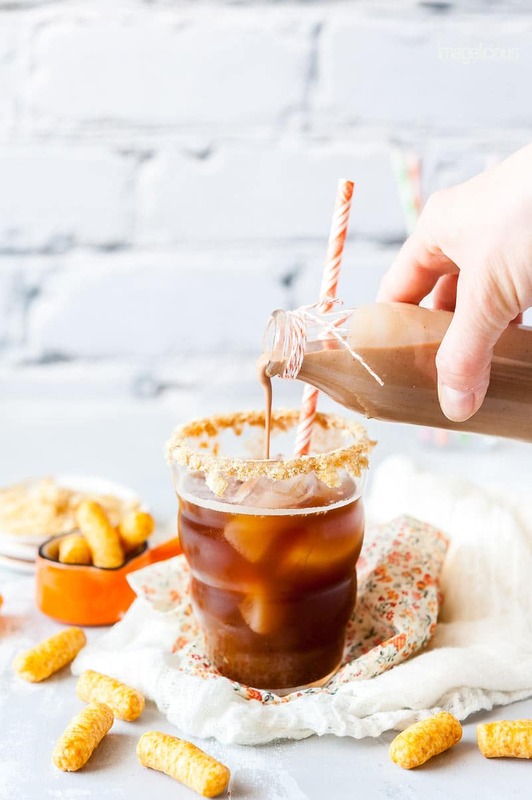 Don’t forget to PRE-ORDER my cookbook, The Ultimate One-Pan Oven Cookbook, that has some delicious and easy desserts that would be perfect to drink with this Iced Coffee!! In a small pot or a sauce pan, add the peanut butter, Nutella, and 3 tablespoons of half-and half cream. Heat on medium while whisking to combine. This should take no more than a couple of minutes. Once the mixture is smooth, add the remaining 3 tablespoons of the half-and half cream. Whisk to combine. Pour into a fridge-safe container and cool until ready to use. 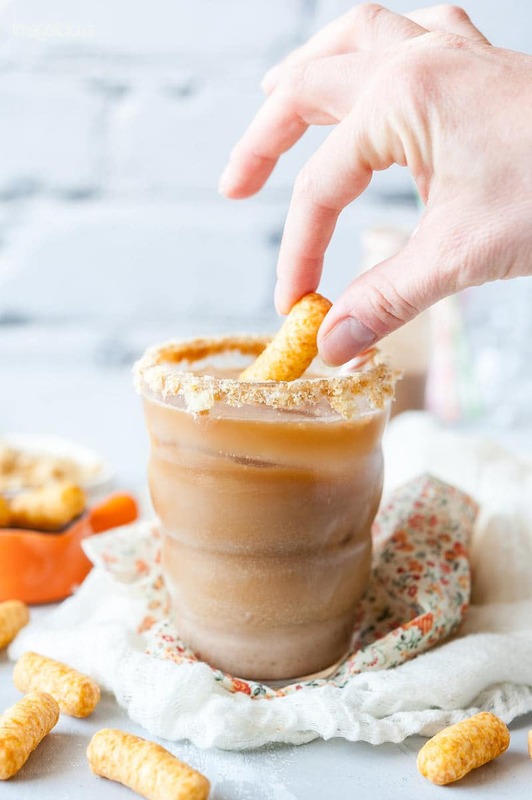 Optionally: lightly brush the rim of the glass with the creamer and dip into crushed peanut butter puffs. Fill a glass with ice, pour cold coffee, add the peanut butter creamer. If you'd like the Homemade Peanut Butter Creamer to be velvety smooth, use a blender to get rid off any lumps. Really love & phenomenal idea. Just love this. Oh my goodness, this really does look sinfully delicious! I’m addicted to peanut butter, and adding it to coffee just sounds like the best thing ever!! And the Nutella is a nice touch too! Who would have thought I’d be drooling over a coffee recipe?!! I love peanut butter also! It’s so delicious and I am so glad I am not allergic to it. And that coffee is so good and almost like a dessert! Nice photography, lighting and set design.